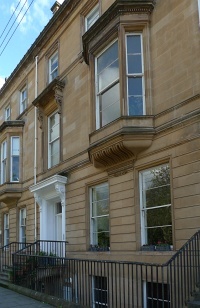 Two sets of drawings were submitted for approval by the Glasgow Dean of Guild Court. The earlier, dated June 1898, shows a laundry and coal store on the ground floor, with a billiard room and a surgery for Fergus's dental practice above. On the later set, dated July, there are some minor differences: what was the surgery is described simply as a 'room', and the position of its fireplace has been changed. Only the S. elevation facing the back lane rises above the utilitarian. It has two curved gables of different widths, reflecting the different sizes of the two principal rooms. The curves, however, mask the triangular pitched roofs behind, an example of the kind of 'deception' that Mackintosh had held up for criticism in his lecture on 'Architecture' of c. 1892. 3 The most striking detail is the cornice, which snakes up and down over both gables in one continuous length. The ground floor was for the use of servants. It was entered either from the back lane or from the yard (or 'green') separating it from the basement of the original house, where the kitchen and other service accommodation were located. The first-floor, including the billiard room, was quite separate. It was entered from the elevated ground floor of the house via an L-shaped corridor, supported on exposed steel or iron beams and cast-iron columns. The walls of the extension are brick with stone dressings, all now (2014) painted and partly roughcast. The floors are concrete, the roofs slated. Next to the entrance to the corridor is a small addition for a pantry, little more than a projecting window. This alone is in sandstone to match the original house. Because of the difference in floor level between the original house and the extension, the corridor includes a short flight of steps. Windows along the side overlooking the yard are largely filled with obscure glass, admitting daylight while hiding the unattractive outlook and preserving the privacy of those within. The pattern of the leading, with a curvilinear motif set against a grid of quarries, has parallels in Mackintosh's earlier furniture for Gladsmuir. 4 John Honeyman & Keppie's job-book entry does not record who supplied the glass. The corridor and the two principal first-floor rooms have open timber roofs. A drawing by Mackintosh for the corridor survives, along wth another for the billiard room panelling (the panelling is no longer visible, having been removed or covered over c. 1998). 5 The style of the panelling has been likened to that of 1897 at Craigie Hall, and the roof trusses to those designed for 233 St Vincent Street in 1898–9. 6 The billiard room chimneypiece is still in position, flanked by tapering square columns with broad, flat capitals; the windows in both principal rooms have comparable surrounds. All the interior woodwork is now painted white, but the original dark grey-green finish is visible in places. In 1998 the extension was converted into a self-contained dwelling, entered from Somerset Place Mews. A staircase was inserted within the former laundry. 2: Both were present at the Club's annual dinner in November 1895: Glasgow Herald, 23 November 1895, p. 6. 3: Charles Rennie Mackintosh, 'Untitled Paper on Architecture', in Pamela Robertson, ed., Charles Rennie Mackintosh: The Architectural Papers, Wendlebury, Oxon: White Cockade in association with the Hunterian Art Gallery, 1990, p. 194. 4: Roger Billcliffe, Charles Rennie Mackintosh: The Complete Furniture, Furniture Drawings and Interior Designs, Moffat, Dumfriesshire: Cameron & Hollis, 4th edn, 2009, pp. 30–1, 43. 5: Information from current owner (2012). 6: Roger Billcliffe, Charles Rennie Mackintosh: The Complete Furniture, Furniture Drawings and Interior Designs, Moffat, Dumfriesshire: Cameron & Hollis, 4th edn, 2009, pp. 67–8. 7: A copy of the report (MBS18) is held by the Charles Rennie Mackintosh Society, Mackintosh Queen's Cross, 870 Garscube Road, Glasgow G20 7EL. The Mackintosh Buildings Survey was funded by The Monument Trust.